Tagged with higher education, ranking, Universitas 21, US. The United States has continued its dominance of Universitas 21’s ranking of national higher education systems, extending its reign of the overall top spot for an eighth consecutive year. But competition is increasing as other countries strengthen their offerings. "Interaction with industry and business is probably more important than formal joint projects"
Released in April, the 2019 rankings saw the US remain the only country to take the top spot in the list’s history. But with increased connectivity, more international students globally, and business links strengthening elsewhere, the gap to competitor countries is beginning to close. “There has been some convergence both at the aggregate level and segregated levels,” said lead author Ross Williams. The biggest movers and shakers in the rankings were Canada, Singapore and Australia, each moving up two spots to come in at sixth, seventh and eighth respectively, while Finland and the Netherlands dropped to ninth and tenth. “[The increase is] an improvement in connectivity, particularly [with] international publications,” explained Williams. He added that changes in positioning should be viewed as countries strengthening, rather than others weakening. Across the overall scores, which take resources, environment, connectivity, and output into consideration, all but 13 of the 50 countries improved. Second-placed Switzerland inched closer to the US, reducing the gap to 11 points. The number of countries with a score above 80 (out of 100) also doubled from 2018. 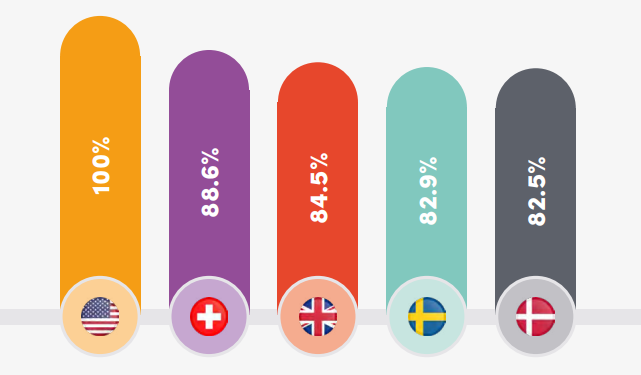 While the US maintained its overall top position, when adjusting rankings by economic activity, the United Kingdom and Finland come out on top, with Serbia, South Africa and Denmark rounding out the top five. Williams, who also works at the University of Melbourne, told The PIE News the purpose of the ranking was to provide better insights and comparisons between countries and to consider the national level performance over institutional. “Many of the variables relate to the tertiary sector as a whole, so it’s wider than the university sector,” he said. By looking at a national view, Williams said, several trends began to emerge – such as the concentration of research-intensive institutions. “The Nordic countries have… about one university in the Shanghai 500, per million of population. You wouldn’t expect China to have quite so many universities per head,” he said. As well as observing connectivity in terms of institutional and transnational partnerships, the U21 ranking also measured the number and quality of business connections. Israel, China, the UK, India and Malaysia were the highest rated by industry. “The publication data favours Eastern Europe… but on the whole, business doesn’t give them a very high rating,” Williams said. “With much of East Asia… the business sector gives them high ratings for integrating and knowledge transfer, whereas the joint publications tend to be not so high.